Grover ROTOMATICS(R) WITH 18:1 GEAR RATIO (102-18 SERIES) The original Rotomatic(R) with an improved higher ratio gearing. The 18:1 ratio provides for finer tuning and greater stability. The finer gears provide smoother tuning and a higher degree of backlash elimination. Rosewood - The most common fretboard, Rosewood is naturally oily, and works well for any surface that sees frequent human contact. The sound is richer in fundamental than Maple because the stray overtones are absorbed into the oily pores. Duncan Designed HB-102b/HB-101n Bridge: The HB-102 was modeled after Seymour Duncan's USA-made SH-4 JB™ bridge. Like the HB-101s, this pickup also use Alnico 5 magnets, but have a hotter winding spec, based on the world's most popular "hot-rodded" humbucker. The bridge pickup is Trembucker-spaced. 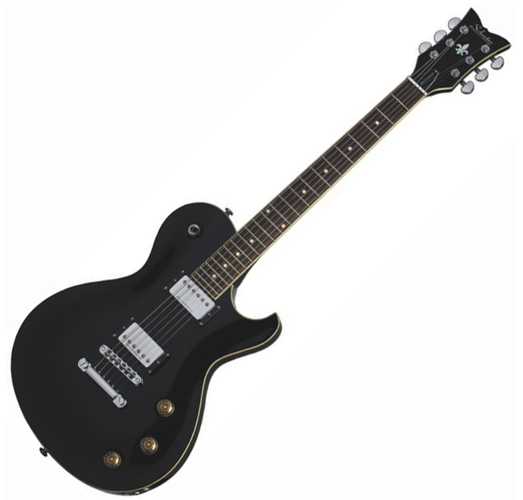 Neck: The HB-101 was patterned after the Seymour Duncan SH-1 '59 Model™ humbucker set. It uses an Alnico 5 magnet and winding spec based on the revered 1955 - 1960 P.A.F. 3-pc Mahogany - Made with 3 pieces of mahogany for extra stability. 3 piece necks can withstand the test of time. Where standard necks may show aging defects from temperature and moisture changes throughout the years, the 3 piece neck will stay nice and straight for a lifetime of playability. TonePros TOM System - TonePros components complete your instrument! Your bridge and tailpiece will be locked down and will not move or "wiggle" at all. With this design, even play or movement in the threads is reduced so that when you adjust your action and intonation, it is set and solid. Which improves your sustain and tonal qualities, makes harmonics "jump" out of your guitar, and more stable tuning.